Haze Cheech and Chong premium Flavored Tobacco and SouthSmoke.com have teamed up and now we are the exclusive importer of Haze products to America. The founders of Haze were the pioneers of the USA hookah tobacco industry back in 2001 in Portland, Oregon with brands such as Sultan tobacco and Hookah splash. Those formulas were passed on to the biggest names in the market and Haze tobacco is still going strong. 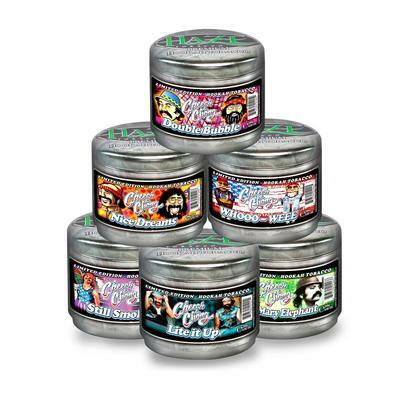 Haze Tobacco has partnered up with the world famous Cheech and Chong. Together they have introduced six limited edition flavors with their signature undyed choppy cut. These tobacco flavors are inspired by the comical antics of the duo and will definitely bring your hookah smoking to a new level. Their "Stack and Haze" packaging is unique in how it can be stacked on top of one another for easy storage and quick mixing. Haze uses only the finest tobacco and the best ingredients. Nothing leaves their facility without a quality check to confirm the final production is "Simply the Best!" Haze has a very unique variety to choose from and their 100 gram pouches are perfect for allowing Hookah users to sample and experience an assortment of tobacco flavors at an affordable price. This size is packaged in round tins with a secondary sealed packaging inside. This package is resealable but prone to rust so make sure to store it at room temperature in an airtight container so that it is sure to maintain its freshness. Haze is pretty juicy and performs well when using any type of bowl such as a traditional Egyptian clay bowl or a phunnel bowl. Always mix up your tobacco to redistribute the juices and then sprinkle it in producing a fluff pack. Be liberal! You are going to want to pack it a good bit higher than you are used to. Just use your thumb and index to lightly drop in the tobacco until it is over the rim and use the foil or HMD to press it down and add a little density to the fluff pack. You will have full contact with the foil but don't worry - Haze can handle the heat! Be generous when poking the holes in your foil and use more heat than you typically do i.e. 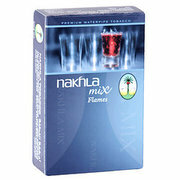 If you usually use two hookah coals then with Haze use three. Do not put your coals in the middle of the hookah bowl but rather around the edge and if you find that your session isn't going strong after about thirty minutes, you probably just need a little more heat.